The Monsanto process is a way of making acetic acid. It uses a catalyst to add a carbonyl group to methanol. This process operates at a pressure of 30–60 atm and a temperature of 150–200 °C. It gives a selectivity greater than 99%. It was developed 1960 by German chemists working at BASF. Chemists at Monsanto introduced a new catalyst system in 1966. Today, chemists make acetic acid by the Cativa process, a similar iridium-based process developed by BP Chemicals Ltd which is more economical and environmentally friendly. So, the Monsanto process is not used very much in industry. The catalytically active species is the anion cis-[Rh(CO)2I2]− (1). The catalytic cycle has been shown to involve six steps, two of which do not involve rhodium: conversion of methanol to methyl iodide and the hydrolysis of the acetyl iodide to acetic acid. (These steps are in the middle of the above diagram.) The first organometallic step is the oxidative addition of methyl iodide to cis-[Rh(CO)2I2]− to form the hexacoordinate species [(CH3)Rh(CO)2I3]− (2). This anion rapidly transforms, by the migration of a methyl group to the carbonyl ligand, affording the pentacoordinate acetyl complex [(CH3CO)Rh(CO)I3]− (3). 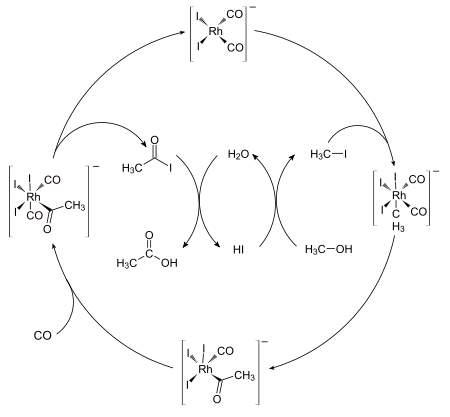 This five-coordinate complex then reacts with carbon monoxide to form the six coordinate dicarbonyl complex. (4) This decomposes by reductive elimination to form acetyl iodide (CH3COI) and regenerate the active form of the catalyst. Acetyl iodide is then hydrolyzed to acetic acid. The reaction mechanism is first-order with respect to methyl iodide and the catalyst (1). Hence the rate-determining step of the catalytic cycle has been proposed to be the oxidative addition of methyl iodide to the catalyst (1). Chemist think that this occurs with the rhodium center making a nucleophilic attack on the carbon of methyl iodide. The Monsanto process for making acetic acid inspired chemists to invent a way to make Acetic anhydride. It is produced by carbonylation of methyl acetate. In this process lithium iodide converts methyl acetate to lithium acetate and methyl iodide, which in turn affords through carbonylation acetyl iodide. Acetyl iodide reacts with acetate salts or acetic acid to give the product. Rhodium iodides and lithium salts are employed as catalysts. Because acetic anhydride is not stable in water, the conversion is conducted under water-free (anhydrous) conditions in contrast to the Monsanto acetic acid synthesis. ↑ "Greener Industry - Ethanoic Acid - Production Method: The Monsanto Process". www.greener-industry.org.uk. ↑ Jones, J. H. (2000). "The CativaTM Process for the Manufacture of Acetic Acid". Platinum Metals Rev. 44 (3): 94–105. http://www.platinummetalsreview.com/pdf/pmr-v44-i3-094-105.pdf. ↑ Zoeller, J. R.; Agreda, V. H.; Cook, S. L.; Lafferty, N. L.; Polichnowski, S. W.; Pond, D. M. (1992). "Eastman Chemical Company Acetic Anhydride Process". Catalysis Today 13 (1): 73–91. doi:10.1016/0920-5861(92)80188-S.